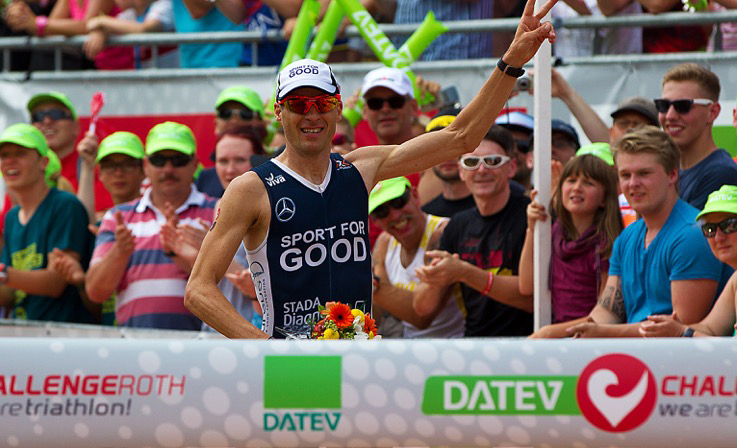 Jul 14, 2015 - The 31st edition of the legendary Challenge Roth (GER) last Sunday was another successful competition for X-BIONIC® Athlete Timo Bracht. He finished 31 seconds behind his last years victory time in 7:56:31h – only 5 minutes behind winner Nils Frommhold who showed an outstanding bike performance and was unbeatable this year. The race started early in the morning at 6:30 am. Timo was in the leading swim group and started very fast on the bike. During the cycling, the later winner showed an extraordinary performance with one of the best long distance bike times ever and Timo lost about 11 minutes to him. But Timo did not give up the fight and got 6 minutes back during the final run. Timo ran the fastest marathon but was not able to close the gap to the leader. Although he could not defend his title, Timo was happy with his race performance: “Today I had a very good race, but Nils showed a better performance that I could not beat this year” mentioned Timo after the race. Timo’s team-mate Horst Reichel who started for the very first time in Roth had a bad day. Due to health problems he could not eat anything during the race and kept far behind his own expectations. But he said that he will return to Roth and is motivated for his comeback next year. We wish both athletes to recover well after this hard competition – have a good preparation time for the next events!